Centuries ago music traveled in boats. Through the ports that connected distant worlds, rhythms were placed that once landed on the other shore, they were never the same again. The “round trip”, the mixture enriched them. Cádiz was one of those scenarios to portray the influence that arrives on the ship from the Indies. 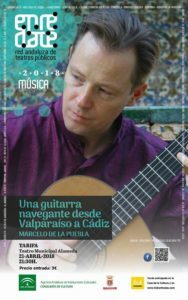 From all this goes “A sailing guitar from Valparaíso to Cádiz”, the concert scheduled for Saturday, April 21 at the Alameda theater. The guitarist Marceo de la Puebla offers a recital inspired by the 300th anniversary of the installation of the Casa de la Contratación de Indias to the city of Cádiz. It will start at 9:30 p.m. and is part of the program of shows of the Andalusian Network of Public Theaters.